Python 3.5, 3.6 although most modules are Python2.7 compatible. A Python library dedicated to NGS analysis (e.g., tools to visualise standard NGS formats). 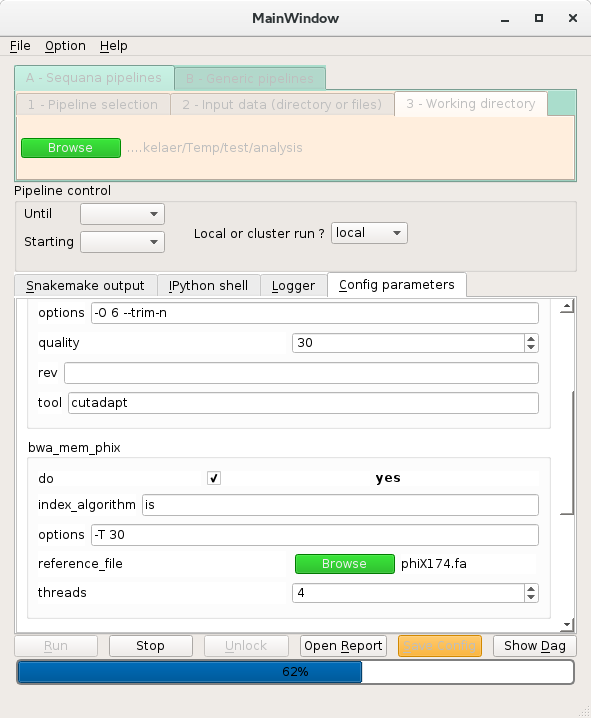 A set of pipelines dedicated to NGS in the form of Snakefiles (Makefile-like with Python syntax based on snakemake framework) with more than 80 re-usable rules (see Rules). Original tools to help in the creation of such pipelines including HTML reports. sequana_taxonomy performs a quick taxonomy of your FastQ. This requires dedicated databases to be downloaded. Currently, the available pipelines cover quality control (e.g. adapters removal, phix removal, trimming of bad quality bases), variant calling, characterisation of the genome coverage, taxonomic classification, de-novo assembly, RNA-seq. See the Pipelines section for more information. Sequana can be used by developers to create new pipelines and by users in the form of applications ready for production. Moreover, Sequanix can be used to set the parameters of pipelines and execute them easily with a graphical user interface. To join the project, please let us know on github. Standalone applications including Sequanix (GUI for snakemake) and the sequana_coverage tool. © Copyright Thomas Cokelaer, 2016-2017. Revision e670e819.